Researchers from Brown University and the Chinese Academy of Science have shown how metal fatigue can be mitigated by ‘nanotwinning’ its structure at the atomic level. The study, published in the journal Nature, details how fatigue is reduced when tiny linear boundaries in a metal’s atomic lattice line up in complimentary pairs known as ‘nanotwins’. Under repetitive strain, the nanotwins deform into linear bands called correlated necklace dislocations. The dislocations remain parallel to each other and don’t block each other’s motion, meaning the effects of the dislocations are reversible and fatigue is diminished. “In a normal material, fatigue damage accumulates because dislocations get tangled up with each other and can’t be undone,” said Huajian Gao, a professor at Brown University’s School of Engineering and corresponding author of the paper. 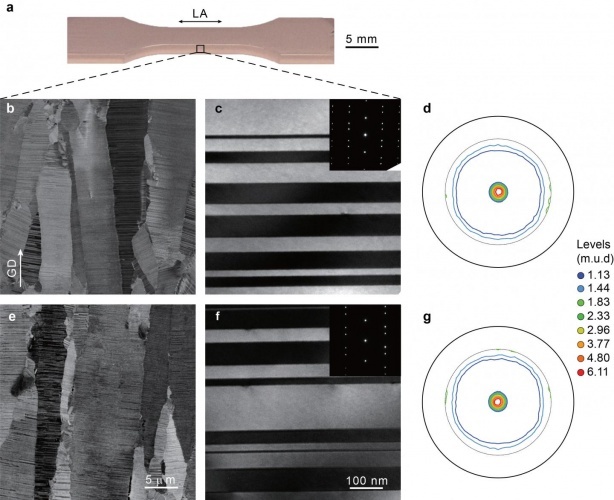 Using electroplated bulk samples of copper with closely spaced twin structures, the researchers performed a series of experiments where they stretched and compressed the material many times at different strain amplitudes. The tests showed that the stress response of the nanotwinned copper quickly stabilised at each strain amplitude, and remained the same when the entire experiment cycle was repeated for a second time. “Despite having already been through thousands of strain cycles, the material showed the same stress response,” said Gao. While metal fatigue is reduced within each crystalline grain, damage still accumulates at the boundaries between grains. Despite this, there is still an overall effect of slowing down the fatigue process, something that could have far-reaching effects if nanotwinning could be applied cost-effectively to large components, as the researchers hope. “Ninety percent of failure in metal components and engineering structures is through fatigue,” said Gao.